Home Cycling Schachmann: "It would not be a failure if I do not win the Itzulia"
Schachmann: "It would not be a failure if I do not win the Itzulia"
The German takes a triplet in four stages and strongly aspires to the txapela. Now come the two decisive stages, the first in the mythical climb to the Sanctuary of Arrate. 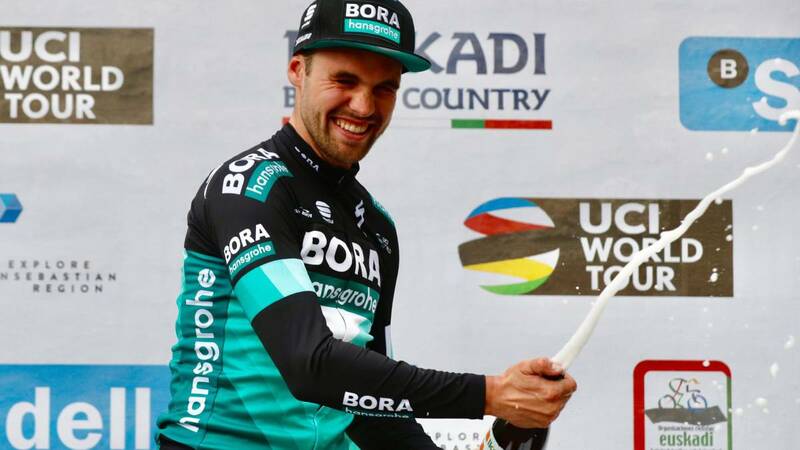 Maximilian Schachmann (Bora Hansghroe) is a serious candidate for the txapela in the Tour of the Basque Country. Faced very motivated the two remaining decisive stages, which will have two other teammates ranked in the top six; a "very comfortable" situation, although the German cyclist would not consider a failure not to arrive in yellow on Saturday in Eibar, "I came away with the idea of trying the third victory and I knew that the end was good for me. bad weather conditions, we were all frozen, suffering a lot, but when you have a team for you you have to motivate yourself and focus on winning, I was and I am very motivated ". The leader of the Basque round, step by step is becoming a aspiring to which everyone looks differently after recitals. He announces that will try to retain the leader's jersey until the end. "The two remaining stages are the most dangerous, but today there was a hard climb and I had a good time, I was ahead with the best. two next stages, but it is sure that I will defend the yellow jersey, "he said. Schachmann does not feel pressured by the possibility of winning the Itzulia, nor would consider a failure the possibility of not finishing yellow on Saturday in Eibar. "I would not consider it a failure, at all, if before I start the race they tell me that I will win three stages I would not have believed it I am a runner in the progression phase, I am 25 years old, I have 10 years left to try to win races and now I think about preserving this form for the classic ones ", he declared. Although Schachmann unfolded like nobody in the rain, the German made it clear that the water on the asphalt is not exactly what he likes." I do not like the rain or wet roads, descents and roundabouts are dangerous, I train with a mountain bike in winter and that helps me survive these stages ". About the rivals he commented that he had not been surprised by the fact that some lost time in the stage, like the Spanish Ion Izagirre, who lost 9 seconds. "The climb was sinuous, very narrow and had to be placed very well, and then the descent was also dangerous, I did expect there to be some differences, there are good climbers, and we will see it in the coming days" . The leader valued the fact of having other two Bora teammates in the top 6 of the overall. "This is undoubtedly an advantage because we have more cards to play in. We are good climbers, if we play smart we can always protect one for yellow. We are in a very comfortable position. " Ion Izagirre still has options, as he is third overall, 52 '' behind Schachmann. "Yates has hit the tug and the group was already punished enough. It has made a hole and Schachmann has managed to hold and then finished at the finish line. There is still a lot of ground and we will have to try it tomorrow or the day after. We will see how the leader responds with the mountain that lies ahead. Here you can not get lost for a second. There have been differences and bonuses. We already knew that it was going to be a tough day and that's how it was, "he said in the finish line at Arrigorriaga. Omar Fraile was not very far in the fourth installment: " The leader is very strong but Ion has also shown that he can win the Itzulia. We will be there to help you even though today we have been stung for a few seconds. They have gone on the last climb attacking on a curve but the differences have not been very big either. The thing about Pello (fall) was a shame, the whole race worked great and in the end you went to the ground. It's a good thing he does not have anything important. "